Alberta’s record low voter turnout in the 2008 election (40.6 percent) raised considerable concern about the state of democracy in the province. Although turnout rose to 54.4 percent in 2012, over the long-term, voting in Alberta is on a downward trend. 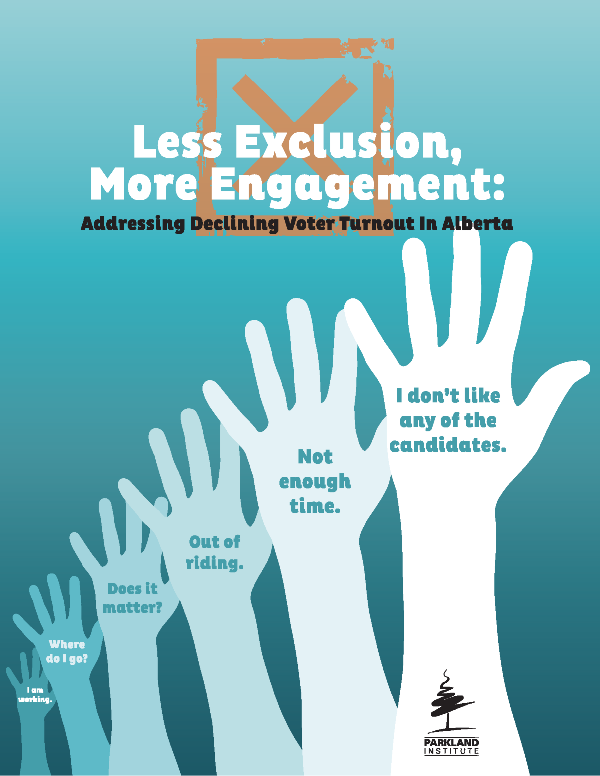 This report uses public opinion data collected in 2008 and 2012 by the Population Research Laboratory at the University of Alberta to examine explanations for non-voting in Alberta in 2008, and to profile non-voters in both 2008 and 2012. Non-voters are profiled by gender, age, region (Calgary, Edmonton, and other), education, household income, home ownership, and immigrant status. Concern over voter turnout is not limited to Alberta. Declining turnout is a phenomenon found throughout Canada, both federally and provincially, and in countries throughout the industrialized world. This study compares the responses and demographic characteristics of non-voters in Alberta with what is known about non-voters elsewhere. Reasons for non-voting among Albertans are broadly reflective of the results of previous research. Chief among these explanations are apathy or indifference towards politics in general, or alienation specifically from politics in Alberta. The study also shows that lack of time or inhibiting structural factors (such as difficulty in establishing voter eligibility) contribute to non-voting. The demographic characteristics of Albertan non-voters are similar to those of non-voters in other jurisdictions. Non-voters are often younger, less educated, and more likely to be renters. Unlike in other jurisdictions, however, household income is not a predictor of voting in Alberta. The unusually high incomes earned by some younger and possibly less educated workers in Alberta may explain this finding. The report recommends that efforts to increase voting in Alberta should concentrate on education and advocacy efforts emphasizing that voting is a responsibility of citizenship. Such efforts cannot be left to political parties, whose interests may lie in discouraging those who support opposing parties. Instead, the media, civil society organizations, and non-partisan political institutions such as Elections Alberta and its federal counterpart should take the lead with non-partisan “get out the vote” canvassing campaigns. Such encouragement might prove successful in getting, in particular, younger people and immigrants, whose participation rates are especially low, to exercise their voting rights. The report also argues that barriers to voting cannot be overlooked. The provincial government, the Legislature, and Elections Alberta have a responsibility to ensure that all eligible voters who wish to cast a ballot are provided the opportunity to do so.